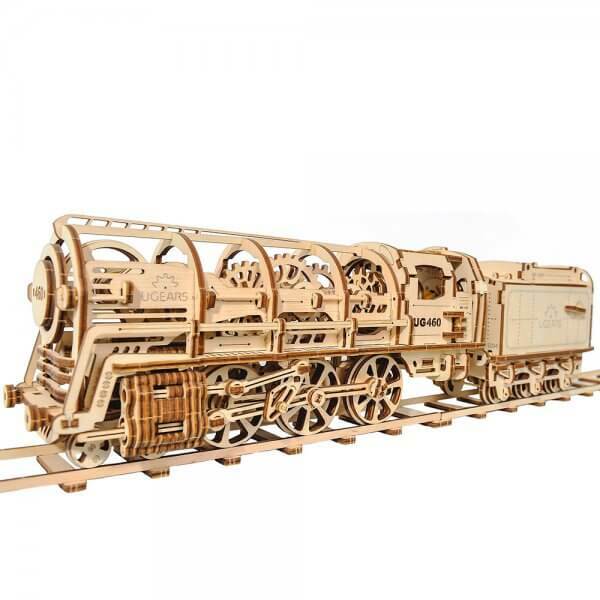 UGears 460 Steam Locomotive with Tinder: UGears wooden train kit. 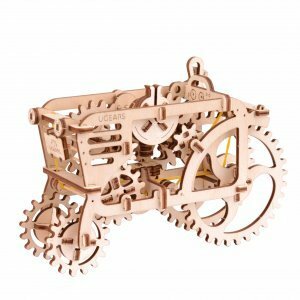 This miniature replica of the 19th century steam engine is a perfect gift to celebrate the era of steam power. 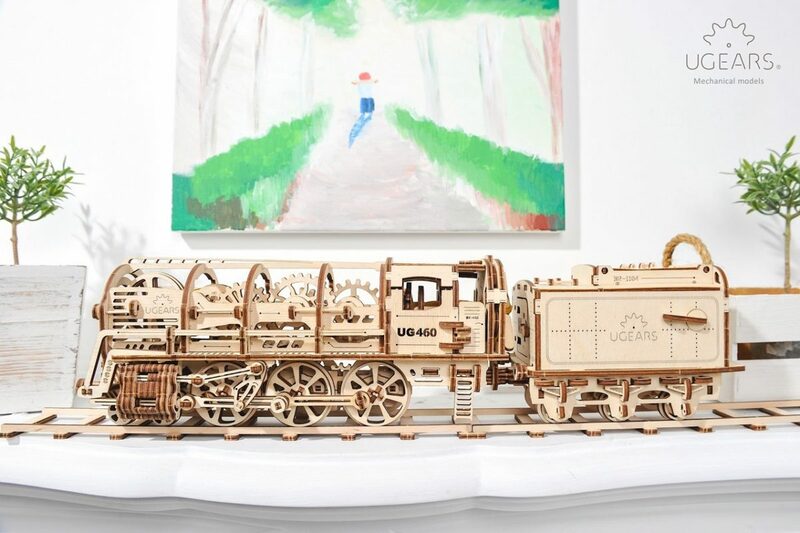 Despite being powered by a rubber-band motor, Steam Locomotive features an ingenious system of visibly functioning asynchronous pistons and valves connected to drive wheels through moving rods and linkages that creates a beautiful working example of a steam engine’s operations. The most popular model at our Kickstarter campaign, Steam Locomotive features real-life details such as, a fully equipped engineer’s cab with retractable step ladder, art-deco boiler trim, and a Tender with functioning doors. 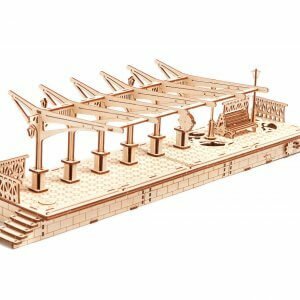 It is our largest and the most complex model to date; nonetheless, with easy to understand step-by-step instructions and quality design it can be fully assembled in a single session. 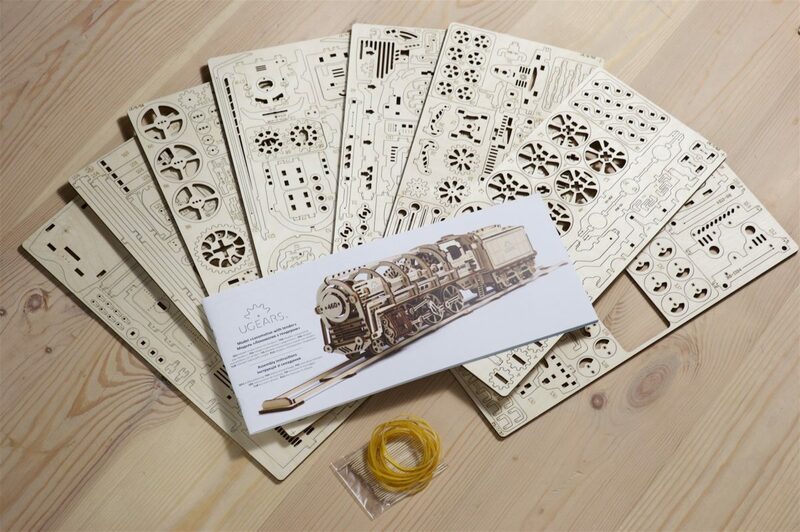 A perfect gift for wooden train kits enthusiasts. 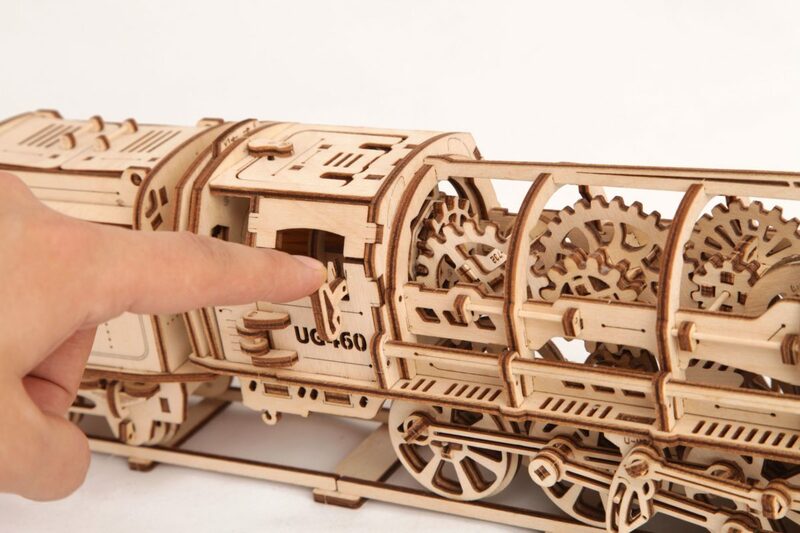 UGears Locomotive is our most complicated model in the line of mechanical vehicles. But don’t feel discouraged! The assembly instruction manual is included with each set. 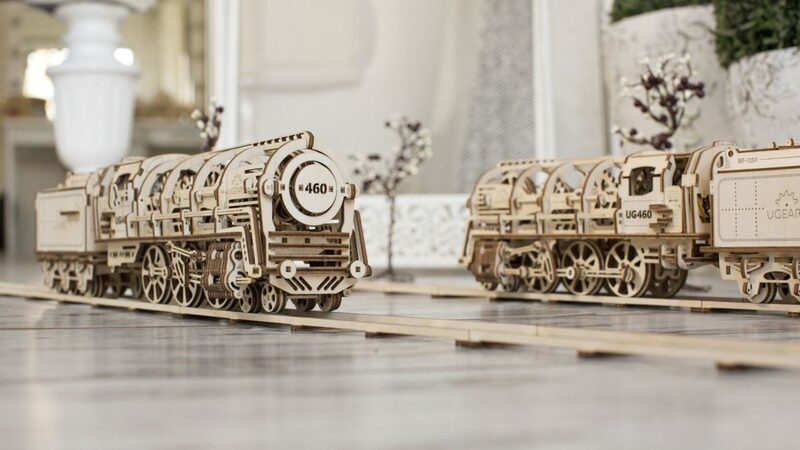 With every step illustrated in 3-d colored pictures accompanied by clear and detailed written directions, this 3-d Steam Locomotive model’s building process is nothing but fun. Like in every UGears vehicle, each part of the Locomotive moves and is completely functionable; all parts inside produce real-life motion. My wonderful lady bought the Steam Locomotive for her uncle’s 60th birthday. I fell in love with it! It was all I could do to not claim it for myself. So she bought one for me for Christmas. I had so much fun building it. It runs so well. I need more track. Ugears should also produce “curved” track. I had no problems with toothpicks, as reported by “Adam,” but I did break some of them during assembly, (thanks for the extras). I had a delightful time building it. Thank you so much! Turned out great! Most everyone that sees it asks about it. A fun winter holiday project when the weather is too cold to go outdoors. Take your time and follow the directions. Checking this site for this year holiday project now! Only flaw (pretty substantial, in my case) I can see is that it should include more substantial axels so I can stop stabbing myself with toothpicks repeatedly. It’s INSANELY hard to get 3-5 toothpicks through 8 separate sandwiched layers of plywood without breaking them, even after waxing them up. Needlenose pliers just crush the toothpick and make them too weak, and trying to tap them in with a hammer often blunts the ends or breaks the toothpick. In some cases, you finish a gear assembly only to find the axels are now to short to sit in their receivers, and you need to pull it apart and start over. Would love to see some sort of different or larger hardwood used, or maybe just make the holes a little bigger to reduce the force required to assemble. Other than that, great! Would recommend! We were fascinated by this modular toy kit! Great quality with really detailed parts, this wooden train kit is a great fun for kids and adults to work on and a nifty cool looking and fully functioning toy as end result. My husband and I spent nearly 10.5 hours straight helping our daughter with building this set on Christmas day eve. We got the wooden locomotive model for our son and we all love it! My husband and son worked on the assembly together (too advanced for an 8 year old to build alone – requires lots of attention to detail and patience). Works wonderfully and charming to see in action. 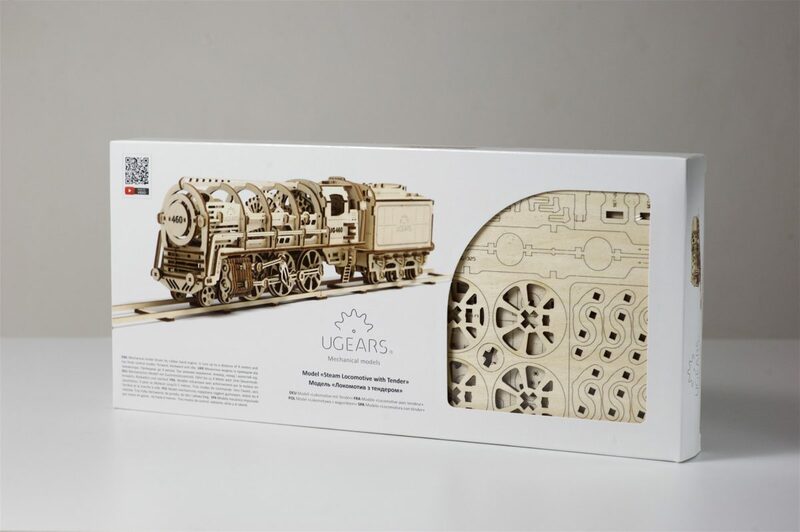 My 14-years old is obsessed with trains and now he is a huge fan of mechanics, thanks to UGEARS Locomotive! He received this set as a gift for Christmas and it spiked his interest right of the box. He spent hours putting this model together, and was able to complete it without any guidance. The fully assembled train is now proudly displayed on a bookshelf in his room. We definitely be looking for more models like this one! 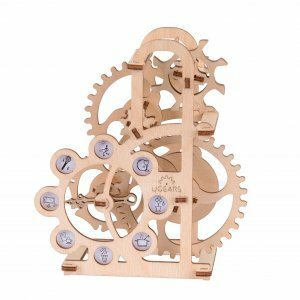 This company has really outdone all puzzle and modular toys makers with this product. 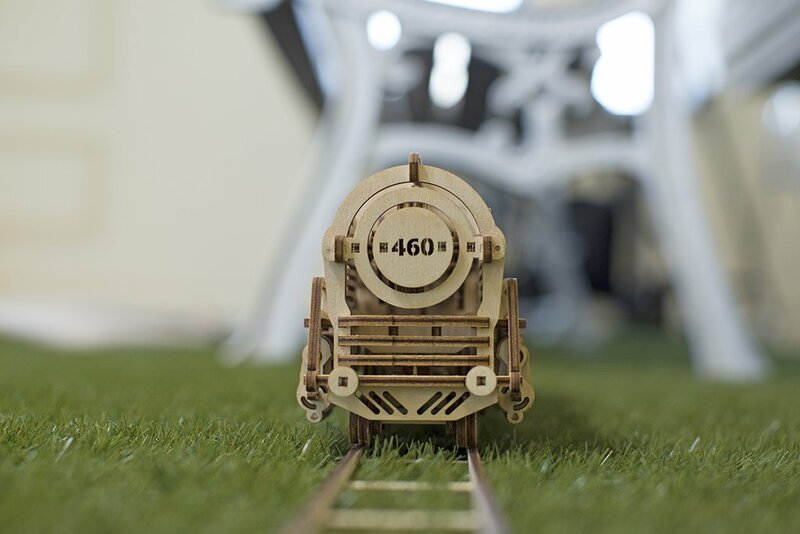 The design is incredible, it looks and works like a real train and is so much fun! All the parts fit together perfectly and require no gluing or cutting. It is costly, but given the number of pieces, you’ll get a lot of time out of it putting the toy together and playing with it after all! Haven’t even finished building it yet, but what a fantastic project! My little kids are really excited to help, maybe a little too excited. A bit pricey, but is worth every penny! Got this toy for my grandson who is turning 13 this year and he loved it. 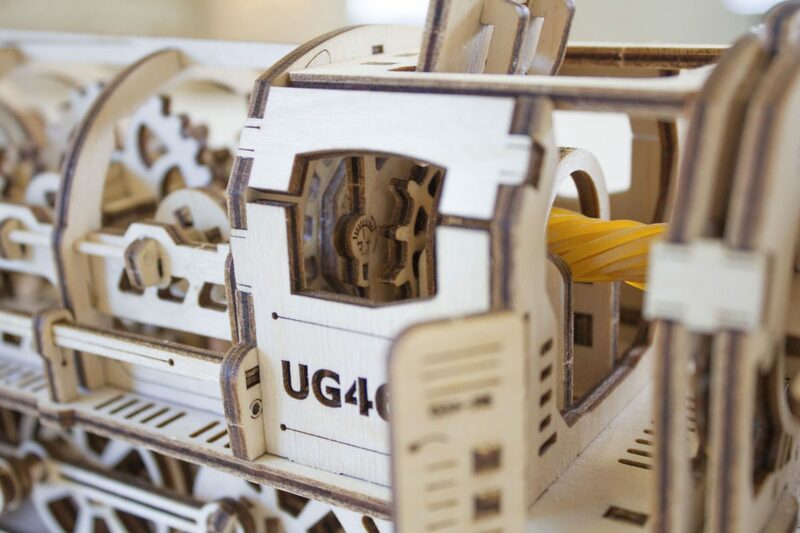 UGears Steam Locomotive can run up to a distance of 16 feet. The distance and speed depend on the winding of the rubber band engine. 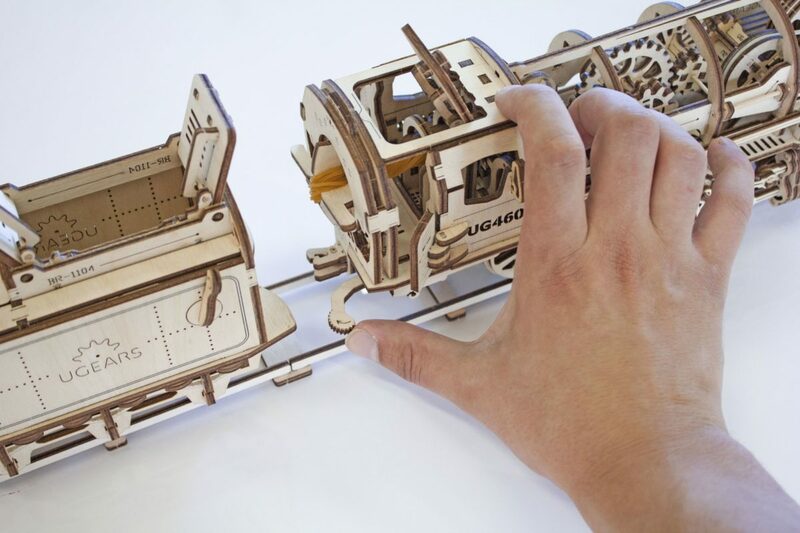 UGears Steam Locomotive comes with 16 feet of track. Separately you can buy addition rails or Platform. It only comes with as much track as you can see in the photo. Only a little longer than the train itself, perfect for display. This was the first time I hit a “home run” with my 12-years old son Anthony Jr. we spend nearly 4 hours working together on figuring this puzzle out and he couldn’t wait for the next day to come soon enough to start working on it again. the first time in my experience, my son wasn’t bored doing something other than playing video games!